Target recently published its 2016 Corporate Social Responsibility Report, which highlights the progress made with regard to its sustainability goals. The report also focuses on the company’s new commitments built around products, team, communities and the planet. The expansive nature of Target’s business and value chain enable it to directly and indirectly impact each of the UN Sustainable Development Goals (SDGs). It has made fast work of meeting and exceeding past goals and has aligned the next set of goals with the SDGs in order to prioritize efforts. In past reporting cycles, Target challenged itself to increase organic food offerings by 25 percent by 2017. It has already exceeded this goal, registering an increase of 139 percent in 2016. Similarly, the company had a goal to make at least 50 packaging designs more sustainable by 2016. It has exceeded this goal and delivered 162 enhanced packaging designs by the end of 2016. Target aimed to achieve Energy Star certification in 80 percent of its buildings by 2020. By 2016, 76 percent of the buildings were certified, and the company expects to meet this goal earlier than expected as well. The retailer signed a Virtual Power Purchase agreement with Stephen’s Ranch Wind Farm in Texas. The 40 MW of wind power it produces is roughly equivalent to the power needs of 60 stores in Texas. The company had committed to reduce water use by 10 percent per square foot in its stores by 2020. It exceeded this goal in 2016 with a 13.7 percent water reduction. It also exceeded its goal of 70 percent retail waste diversion by 2020, and finished off 2016 with a diversion rate of 72.3 percent. In 2016, Target granted nearly $40 million in funding to organizations across the country to help youth and families build lifelong healthy habits, making "better-for-you" living easier and more accessible for all. It partnered with leading organizations committed to delivering proven solutions that help youth and families increase their physical activity and eat healthier every day. Target has also announced one of the most comprehensive chemical strategies in the retail industry, focusing on driving transparency and ensuring proactive chemical management and innovation across every product the company sells, throughout business operations. The clarity of the goals has inspired many organizations to align sustainability progress. 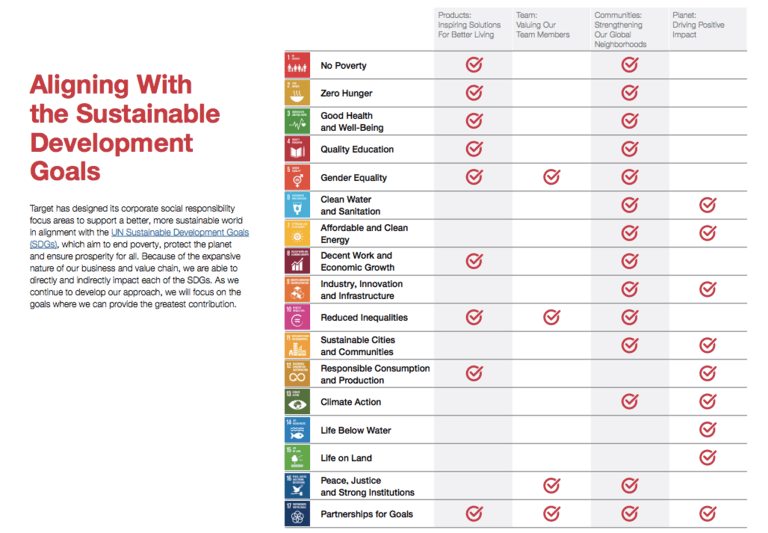 As Target's checklist demonstrates, the SDGs are an excellent way for organizations to measure impact both positive and negative. We expect to see more organizations using the SDGs to report on sustainability in the future. 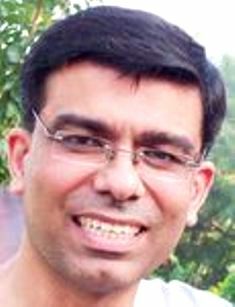 Vikas is an MBA with 20 years of managerial and entrepreneurial experience and global travel. He is the author of "The Power of Money" (Scholars, 2003), a book that presents a revolutionary monetary economic theory on poverty alleviation in the developing world. Vikas is also the official writer for an international social project for developing nations "Decisions for Life" run in collaboration between the ILO, the University of Amsterdam and the Indian Institute of Management. A version of this post originally appeared on Justmeans.